The Eastern Shore includes only a small part of the Chesapeake Bay watershed, but contributes disproportionately large loads of the excess nitrogen and phosphorus that have contributed to ecological and economic degradation of the bay in recent decades. Chesapeake Bay is the largest estuary in the United States and a vital ecological and economic resource. The bay and its tributaries have been degraded in recent decades by excessive nitrogen and phosphorus in the water column, however, which cause harmful algal blooms and decreased water clarity, submerged aquatic vegetation, and dissolved oxygen. The disproportionately large nitrogen and phosphorus yields from the Eastern Shore to Chesapeake Bay are attributable to human land-use practices as well as natural hydrogeologic and soil conditions. Applications of nitrogen and phosphorus compounds to the Eastern Shore from human activities are intensive. More than 90 percent of nitrogen and phosphorus reaching the land in the Eastern Shore is applied as part of inorganic fertilizers or manure, or (for nitrogen) fixed directly from the atmosphere in cropland. Also, hydrogeologic and soil conditions promote the movement of these compounds from application areas on the landscape to groundwater and (or) surface waters, and the proximity of much of the Eastern Shore to tidal waters limits opportunities for natural removal of these compounds in the landscape. The Eastern Shore only includes 7 percent of the Chesapeake Bay watershed, but receives nearly twice as much nitrogen and phosphorus applications (per area) as the remainder of the watershed and yields greater nitrogen and phosphorus, on average, to the bay. Nitrogen and phosphorus commonly occur in streams at concentrations that may adversely affect aquatic ecosystems and have increased in recent decades. 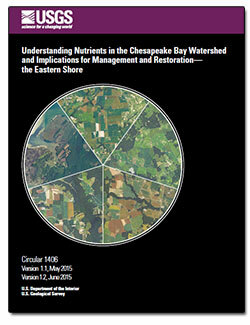 Ator, S.W., and Denver, J.M., 2015, Understanding nutrients in the Chesapeake Bay watershed and implications for management and restoration—The Eastern Shore (ver. 1.2, June 2015): U.S. Geological Survey Circular 1406, 72 p., https://dx.doi.org/10.3133/cir1406.